The 1962 Impala SS 409, featured new "C" pillar styling for all models except the 4-door hardtop. The sport coupe models now featured the “convertible roof” styling shared with other GM “B” full-size hardtop coupes. 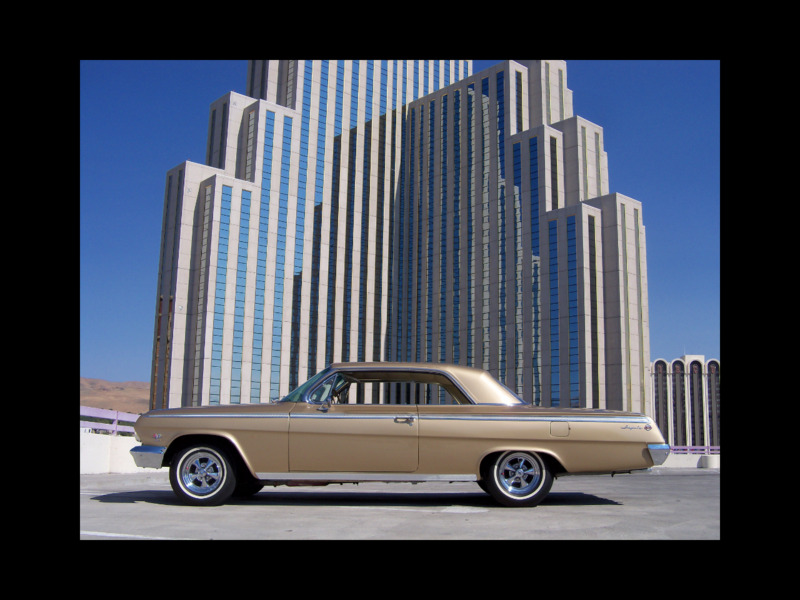 These styling changes proved to be successful and the ‘62-’64 Impalas became great collector cars. The “overhang” roof style of the sedans was replaced with a more attractive, wider “C” pillar with wraparound rear window. The SS had a more distinctive appearance that featured a panel that housed the taillights in a special engine-turned aluminum, which was also used to fill the side moldings. Engine choices were consolidated with a 409ci V8 replacing the 348ci and could be had with any transmission. The 283ci was replaced with a 327ci. The Beach Boys popularized the well-appointed Impala with the song “409” referring to the new V8. Please feel free to call if you have questions: 775-843-2549 for David or Sharon 775-848-9630. Message: Thought you might be interested in this 1962 Chevrolet Impala SS.